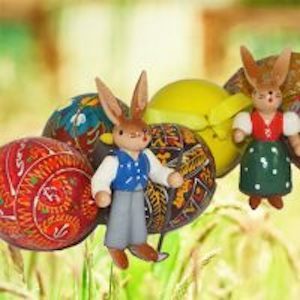 German Easter traditions include many that we think of as universal — Easter eggs, Easter baskets filled with sweets, and, of course, the Easter bunny. In fact, some of these traditions likely originated in Germany, some date back to ancient times, and some have their roots in pagan celebrations. Nearly all include symbols of Earth’s rebirth each spring, when winter’s darkness ends, snows melt, daffodils grow, and the end of Lent is nigh. And, for those hardy souls who gave up sweets for Lent, Easter brings a sweet release — the torment of a confectionery-free existence is no more! Both the hare and the egg have been symbols of fertility and renewal of life since the time of the ancient Greeks. Both symbols can be found depicted with Aphrodite, and also with the Germanic goddess Holda. In Christianity, eggs were symbols of resurrection and made great gifts at Easter. The first recorded connection between rabbits and eggs appeared in a book by Georg Franck von Franckenau in 1682, titled “De ovis paschalibus – von Oster-Eyern.” He described how bunnies would hide eggs for children around Easter, and also warned that over-consumption of eggs may lead to stomach aches. But the Easter Bunny wasn’t always the main animal at Easter. Up until the early 1800s, bunnies competed with cuckoo birds, foxes, roosters and storks for the honor of hiding the eggs. Then, the hare prevailed. In the early 20th century, bakers all over Germany began to offer bunny pastries and, eventually, hollow Easter bunny chocolates (made by using a centrifugal technique copied from beekeepers) in their stores. 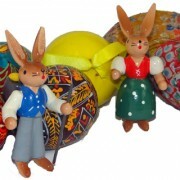 Today, some German children still believe that, if they are good, the Osterhase will lay a nest of colored eggs. Then, these will be hidden throughout the house for the children and family members to find! Painting hard-boiled eggs is a very old tradition. 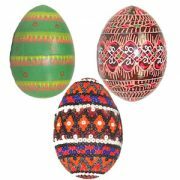 In Eastern Europe and the ethnic Sorbs of East Germany, Easter egg painting is a special art form. The bright colors reminiscent of burgeoning spring flowers have specific religious meanings: red for the sacrifice of Christ, yellow for the desire for enlightenment and wisdom, white for purity, green for innocence, and orange for strength and ambition. Today, the tradition of giving Easter eggs and other gifts transcends religious, ethnic and cultural affiliations. Painting, hiding and hunting for hand-colored eggs along with confectionaries will bring smiles to children of all ages! Eggs on Twigs (Osterstrauch) — Prick a small holes on each side of a raw painted egg, carefully blow out the liquid content and hang with cheerful ribbons around the bare twigs of a bush or tree. Egg Tapping (Osterei Titschen) — Take two painted hard-boiled eggs and two players. First, the two narrow ends are tapped against each other until one breaks. Next comes the round ends. Who’s egg remains intact wins. Hint: its the skillful movement of the wrist that makes the difference. Egg Roll (Osterei Schieben) — Take hard-boiled eggs and let them roll down a grassy, sloped hill. Chidren can push the egg with a stick when they are stuck. The egg that reaches the goal at the bottom of the hill wins wins. Egg Run — Balance a raw egg on a spoon and run 25 meters. Those come in first with an unbroken egg win. Egg Throw — Using a sling-shot made out of wool, hard-boiled eggs are thrown as far as possible across a meadow with tall grass (for a soft landing). In Southern Austria, eggs are flung across a house and buried on the other side which brings luck. 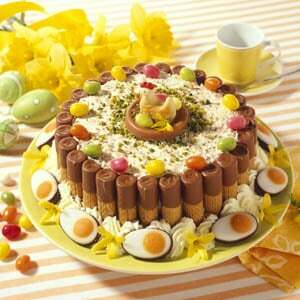 In Germany the celebration of Easter starts on Thursday and ends on Sunday, with traditional dishes for each day. The first day is Gründonnerstag, or Maundy Thursday. The name Gründonnerstag derives from greinen, an old German word for mourning or crying. However, since Gründonnerstag sounds like “green Thursday” in German, many people celebrate by eating green dishes like Seven Herb Soup! On Karfreitag (Good Friday) it’s traditional to eat a fish dinner with one’s family. Then, on Ostersonntag (Easter Sunday), the whole family gathers together to celebrate with a festive Easter dinner. The main dish is often lamb, since it represents innocence and humility, and carries further religious meaning in many Christian traditions. In Germany, Ostermontag (Easter Monday) is also a holiday and another occasion for families to come together and celebrate. In some regions in Eastern Europe, it is a tradition for young lads to spray water on innocent victims, usually girls or friends. This may develop into a full-fledged water fight. In Hungary and adjacent regions, the liquid of choice is a bit of perfume… and, of course, real gentlemen use expensive and carefully selected perfume for the ladies of their choice! After the holiday, the pleasure continues — with leftovers! One traditional leftover dish is called Eier in gruener Sosse (Eggs in Green Sauce). Despite its name, it is a delicious favorite, not to be confused with Green Eggs and Ham by Dr. Seuss! 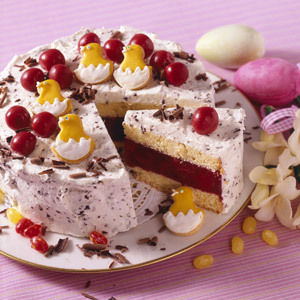 For more recipes, including recipes for festive cakes, visit our German Easter Recipes page! German confectioners produce a large variety of unique and delicious German Easter Sweets to hide among the yellow Forsythia bushes and crocus leaves, place in the Easter basket, or take a starring role on the Easter table. Some examples: nougat-filled egg shells – yes, real egg shells, carefully cleaned and refilled with delicious hazelnut chocolate; Schaumküsse (marshmallow kisses), which are made from fluffy marshmellow cream enrobed in dark and milk chocolates; or Luebecker marzipan filled eggs. 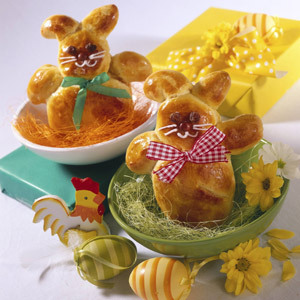 These and other products are available online in the Easter section of our web shop The Taste of Germany.com.